Founded in 1955, Ghana International School (GIS) has continued to be the leader in delivering the English National Curriculum in Ghana. Accredited by the Council of International Schools (CIS) and the New England Association of Schools and Colleges (NEASC), GIS has won a reputation around the world for academic excellence. The school accepts applications for children from ages three to eighteen. Upper Secondary School students follow the Cambridge International Examinations' IGCSE and GCE A-level courses. 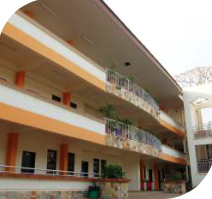 Ghana International School (GIS) is one of Ghana’s leading international schools providing world class holistic education to children between the ages of 3 years and 18 years across its four sections namely: Infant School, Junior School, Lower Secondary and Upper Secondary School. The school is a not-for-profit, private, non-sectarian, coeducational day school established in September 1955. It was the first educational establishment to provide international education to students of all races and creeds, at a time when the Gold Coast was yet to achieve full independence. Sixty years on, GIS continuous to provide quality education to both international and local students in a completely different and more competitive educational setting. GIS offers a curriculum modeled along the English National Curriculum and Cambridge IGCSE Curriculum and General Certificate of Education (GCE) Advanced level with English language as the medium of instruction. Ghana International School after years of application and hard work is the first and only international school in Ghana to be accredited by both New England Association of Schools and Colleges (NEASC) and the Council of International Schools (CIS) in 2007 and 2008 respectively. The school is also an active member of the Association of International Schools in Africa (AISA). Currently, GIS enrolls approximately 1400 pupils and students from over 50 countries across the world. Ghana is an amazing country and the local people are very friendly. School - Behaviour Management, Support for Learning, School Management, Assessment, Facilities, Internet connection, Substance rather than appearance, Corruption in the school system, Staff Moral. It's great to be in a popular school of Ghana! My classmates' behaviour, the food in the canteen is always the same, it's all I am not allowed to eat at home. They can always give it a try! the teachers are wonderful! Run away from that school! GIS should recruit a foreign principal and more expatriates. Use a better Private approach to student and praise them. Run away unless you have nothing else to do in your life! Local teachers abysmal! always late, or sleeping. Poor professionals and rarely performing up to an international standard background. Appropriate Modeling from teachers...teachers dress badly and should improve their dressing code!